This kitten was found in a garbage can in Istanbul by a 7-year-old girl and it seemed he had been in the bin for quite a period of time. But nobody stopped long enough to hear the cries or even to want to find out what was making the sounds and this 7-year-old girl was the only one that cared enough. How this poor cat must have suffered during that time. The girl’s father is a doctor so seeking medical help (which he urgently needed for him) was not so hard. 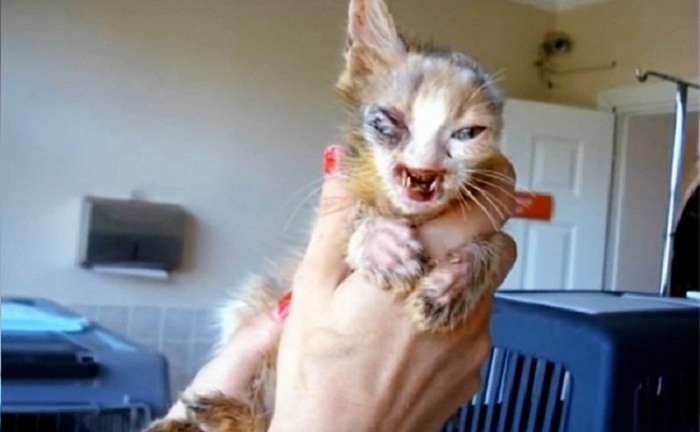 His entire face was infested with maggots and mites, his ears and mouth were very much deformed and getting him back to health was no easy thing. After months of medical attention, love, care and dedication, he slowly got better.